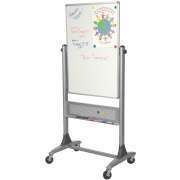 Buy Mobile & Reversible Whiteboards: Enjoy Our Selection! Mobile boards come in handy when you have lots to write. With two sides, you can keep important points up on one side of the board and give it a quick flip to put down even more information on the next side. 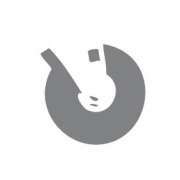 If anyone needs to be reminded of the original information, it is only a flip away. 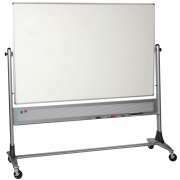 Where do you need a two sided whiteboard? Reversible boards are helpful to have when teachers share a common classroom. They are also helpful for company seminars and large meetings. Hertz Furniture has a great selection of reversible whiteboards so you can choose the medium and style that fulfill your needs. What kind of board should I get for my meeting room? 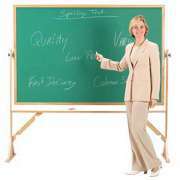 When a visible presentation space is needed in business or education applications, a portable whiteboard can be quite convenient. If a speaker wants to give examples or write down important notes and points as a lecture is in progress, whiteboards provide the perfect space to do so. When explaining abstract concepts, outlining a strategy plan or keeping track of new ideas, it is always helpful to have a large space to write things on that is visible to all participants. The double-sided model is preferable to a regular chalkboard or dry erase board because it provides twice as much writing space. Even in a narrow room or small space where a large board will not fit, you can get the same amount of writing space with a medium double-sided board. This arrangement is great for meetings, lectures, training sessions and classes. It provides a highly-visible surface that will keep everyone on track. If you have a classroom with a collaborative teaching setup, each teacher can use one side of the board without having to erase the other&apos;s work. What&apos;s so great about a reversible whiteboard? With two sides to write on, everyone saves time. When lecturers have to spend time erasing in the middle of a session, they might lose the attention of the class or forget what they were talking about. Rather than having to constantly erase the board to make space for new notes or examples, it can simply be flipped over to reveal a whole new surface. The mobile whiteboard arrangement is also great because when you want to go back to a concept that was discussed earlier, rather than having to rewrite everything or trying to remember exactly what was on the board, you can simply flip back to the first side for easy reference. A double sided whiteboard is the ideal choice for an educational setting in which many teachers use the same classroom throughout the day. If one educator fills up the front of the board with information about the upcoming Read Across America Day and neglects to erase it before the math lesson afterward, the next teacher can simply flip the board over to the clean side without having to spend time erasing. What are the pros and cons of blackboards and whiteboards? Personal preferences regarding mobile whiteboards vary. While chalk can create dust and get on clothing, it is also easy to wash away. Dry erase boards can be used with many colors and are easy to write on, but markers can stain clothes and many people do not like their smell. In a business or school where different people are using the mobile board, the ideal is to enable every person to have the surface material they prefer. A great way to ensure that everyone can have their preferred board is by purchasing a reversible whiteboard chalkboard with a dry erase board on one side and a blackboard on the other. With this arrangement, each person can write on the surface they are most comfortable with without having to use a particular room or run around searching for the right portable board. Teachers can just walk in the room, flip the board to the desired side and begin the lesson. 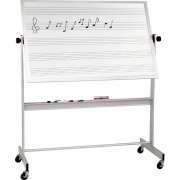 What kind of reversible whiteboard can I get for the music room? Double-sided whiteboards can come in handy for special applications as well. When bringing music into the educational environment, it is important to make sure that your school is equipped with the proper materials to provide clear instruction that will help students advance. With the proper music room design, you can show budding musicians the value of the arts and encourage them to stay motivated in their musical pursuits. 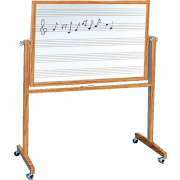 A reversible music board will make instruction during band class, orchestra rehearsals and theory lectures much easier. With musical lines on both sides of the board, you can focus on two different sections of the score. When you want to go back and forth between two songs, you can simply flip the board back rather than rewriting the same notes over and over again. 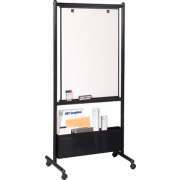 Another option is to get a model with a music staff whiteboard on one side and a regular dry erase board on the other. This is great if you want to switch off between sections of the score and written information. Get double the writing space without having to use up any extra floor space with reversible whiteboards from Hertz Furniture. Double-sided boards are great for businesses, schools and anywhere else where a clear writing space is needed. With our excellent selection of models from BestRite and Aarco, you can be sure that you are getting top-quality products from names you can trust.